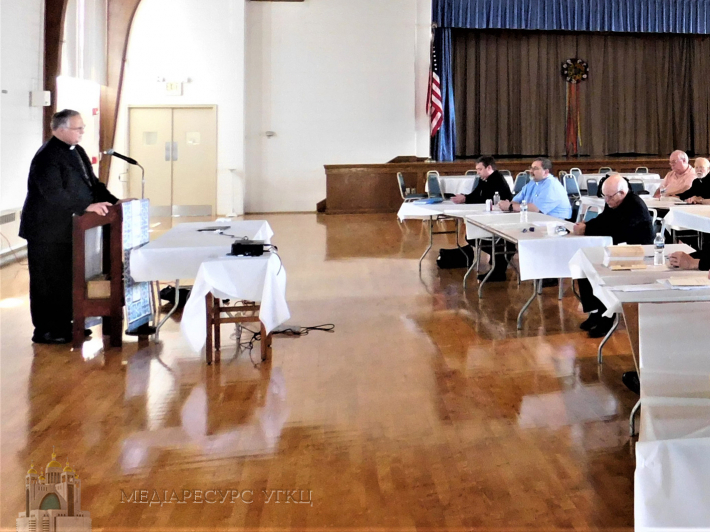 Philadelphia, Pa.--The Spring Clergy Conference for the Ukrainian Catholic Archeparchy of Philadelphia was held here Wednesday, May 23, 2018 in the social hall of the Ukrainian Catholic Cathedral of the Immaculate Conception. 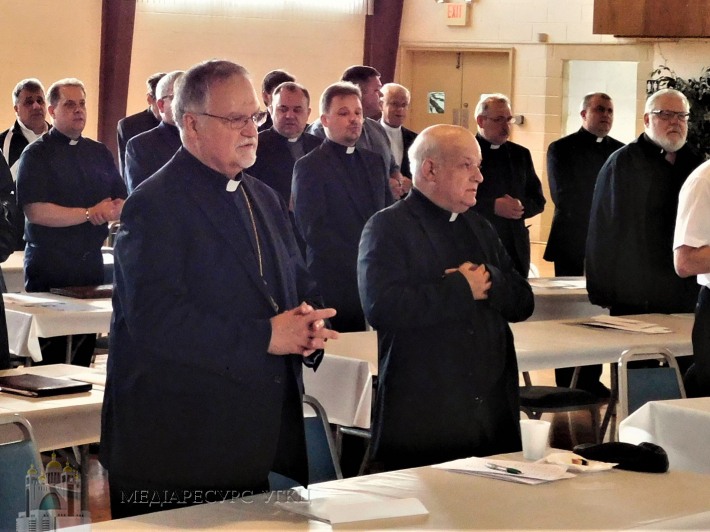 Bishop Andriy Rabiy, Apostolic Administrator, welcomed the clergy and led the priests and deacons in the opening prayer. The 2017 financial statements for the archeparchy and related institutions were distributed and reviewed by Archieparchial Econome Mr. John Drozd. Mr. Richard Turzanski from the Philadelphia Office of the United State Department of Homeland Security gave a presentation on safety in church and parish properties. He advised how each facility should be reviewed, how parishes should cooperate with local police departments and emergency responders so that local law enforcement agencies are familiar with the exterior and interior layouts of the buildings well before being called for an emergency situation. After a lunch break, Bishop John Bura gave an informative presentation on the Theology and Spirituality of Icons, which included a detailed explanation of the Icon of of the Savior, Image Not-Made-By-Hands and several Mother of God icons, including the Oranta. The meeting concluded with some personal reflections from Most Reverend Stefan Soroka, Archbishop-emeritus of Philadelphia on his 17 years of service as spiritual leader of the archeparchy. With around of applause and a standing ovation, the clergy conveyed their appreciation with the singing of Mnohaya lita, wishing Archbishop emeritus Stefan with many happy and blessed years. At the conclusion of the conference, the former cathedral school building which was renovated and serves as the new location of the Archieparchial Chancery was formally blessed.